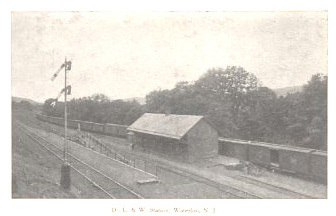 Waterloo's wood frame station was built in 1854, when the connection was made with the Sussex Railroad. A large new water tank was built at Waterloo in 1881. On September 1, 1890, the boiler of a Delaware, Lackawanna & Western locomotive named the Morris exploded at 2:05 P. M. while standing on the upper track at Waterloo, waiting for the Sussex Railroad passengers on the 1:30 mail train from Newton to board. Though many people were standing on the platform, no one was seriously injured, despite the heavy rain of shrapnel. The 400-pound cast-iron sand box on top of the boiler shot high into the air and came down through the slate roof of the depot, crashing through one floor to lodge in the ceiling above Whitfield N. Gray's ticket office. Some pieces thrown into the air weighed a half ton apiece. Martin F. Wintermute, of Townley's Photo Gallery in Newton, happened to be on the Sussex train and had his camera with him. He got seven or eight excellent views of the wreck. The turntable (50 footer) was removed soon after 1902, after the 'Stanhope Cutoff' was inaugurated and the Waterloo leg of the Sussex Railroad began to be disused as a connection. About half of the track remained in place however, extending from the branch north of Waterloo road, to serve the Mountain Ice Company siding. The last agent at Waterloo, J.W.A. 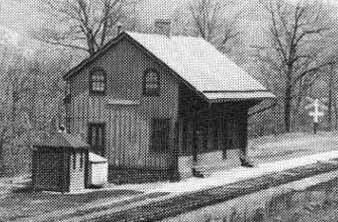 Lee, was discontinued in 1922 and the station building was later (after 1940) replaced by a smaller shelter. 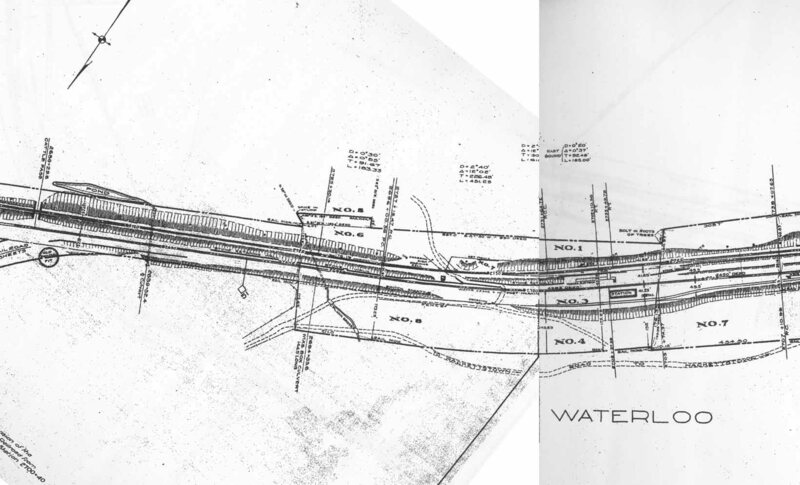 From the 1940s Waterloo was the only regular station stop on the Lackawanna which did not have a building or shelter roof. The rude shelter which replaced the station burned down in 1946, the victim of a grass fire. Waterloo station area: 1918 Valuation Map. Waterloo: This is a 'combination map' which I created by cutting and pasting together the "Hackettstown 1898 NE section + Lake Hopatcong 1905 NW section joined combo of 2 USGS topo maps-- 7.5 minute series" map.